This is a beekeeper’s idea of a fun Saturday night. My husband Henry is transitioning from being a hobby beekeeper to a professional who specializes in mite-resistant colonies that are well adapted to local conditions. He successfully overwintered one hive that we’ve had for several years, but this spring, he put the word out that he would catch honey bees swarms or remove colonies from houses, barns, and such. Now he is tending over twenty hives. Henry is working toward building up healthy colonies, so next year he can start selling them to amateur beekeepers in the area. 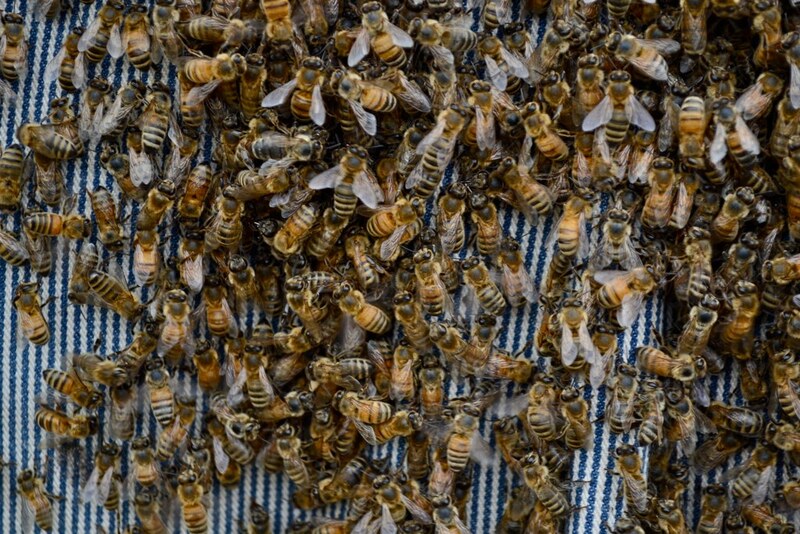 In the past 15 or so years, beekeepers across the country and the world have lost millions of colonies to an upsurge in mites and disease. Treatments for these conditions often use nasty chemicals that are not necessarily effective. Henry, among others, is looking to feral bees that have survived for years without human intervention for the genetics to propagate a strong honey bee population. These hardier colonies exist around our area in bee trees, eves of houses, and in other strange places. 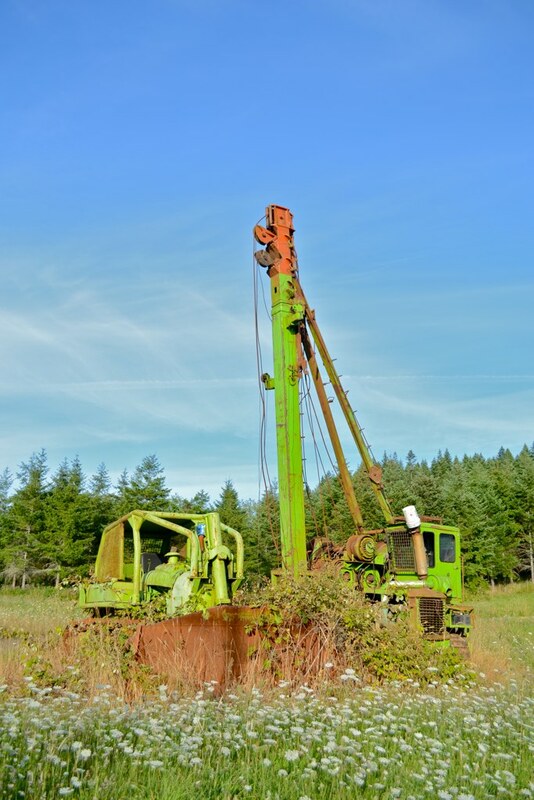 In this particular case, Henry got a tip off from a client that some bees had been living inside a defunct Terex bulldozer (aptly named Kermit) for at least two years. 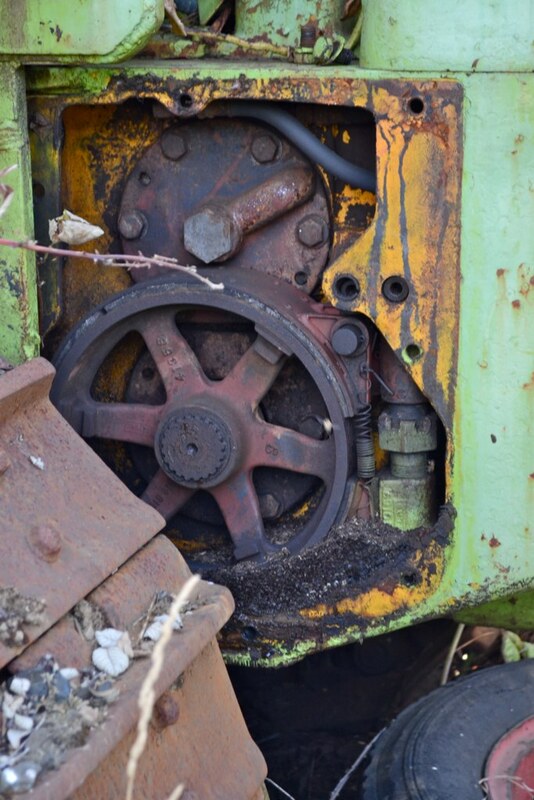 The owners of the equipment were hoping to sell or scrap the dozer in the near-ish future, so they wanted the bees gone. 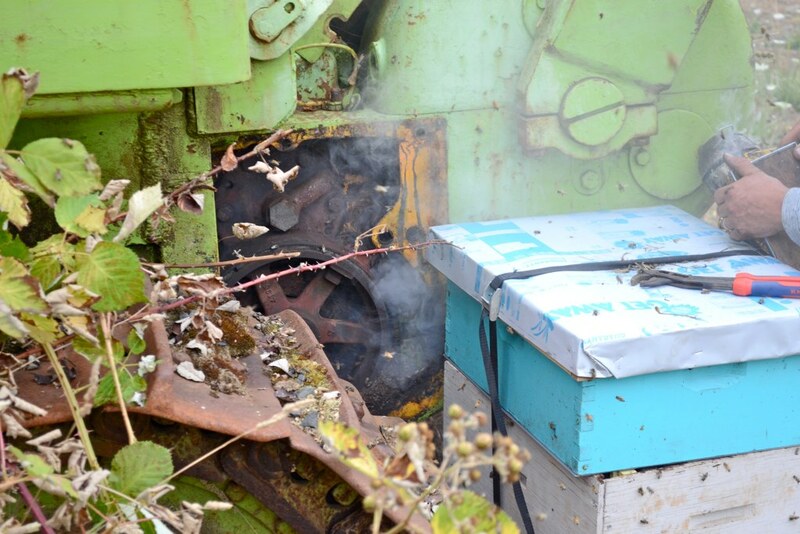 When we arrived on the scene, the bees were flying in and out of a small opening near the tracks. It just so happened that the opening was on a plate that could be easily removed by unscrewing just two bolts. A piece of cake, right? 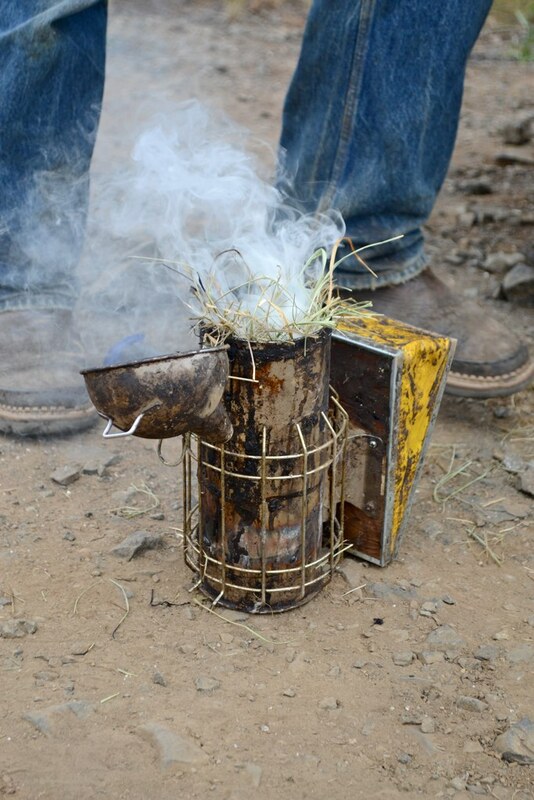 Henry fired up his smoker by lighting some dry grass and then burlap. 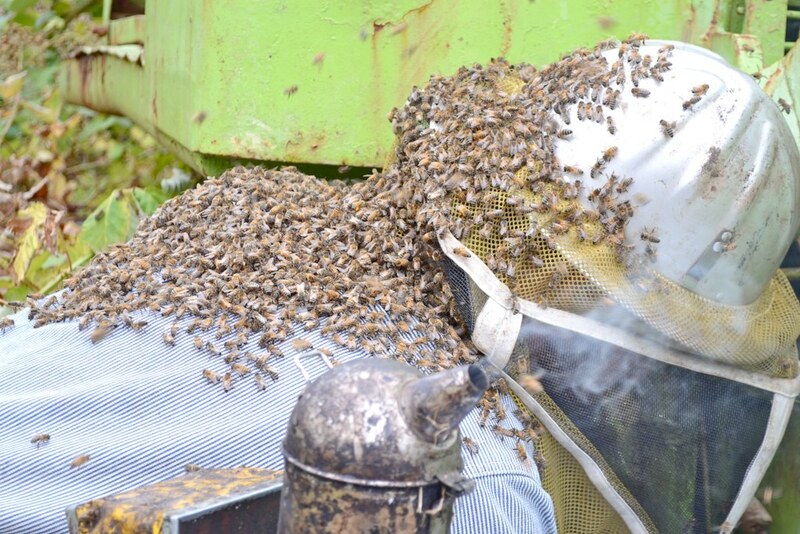 Smoke masks alarm pheromones sent out by bees, and it tricks them into thinking the hive is on fire, so they gobble up a bunch of honey and take flight in a calm state. 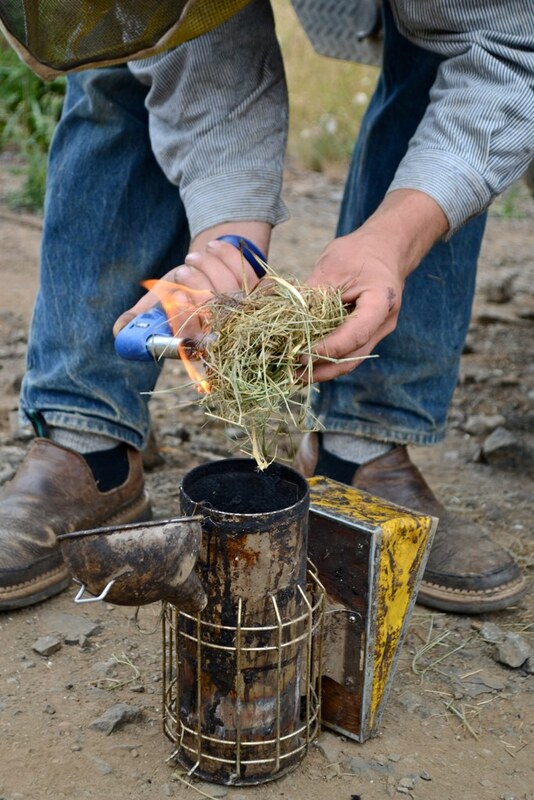 Burlap is the smoking material of choice for many beekeepers because it smolders for a long time at a low temperature. Oh wait, there weren’t any bees under the plate. The mission was turning out to be much more complicated than anticipated. 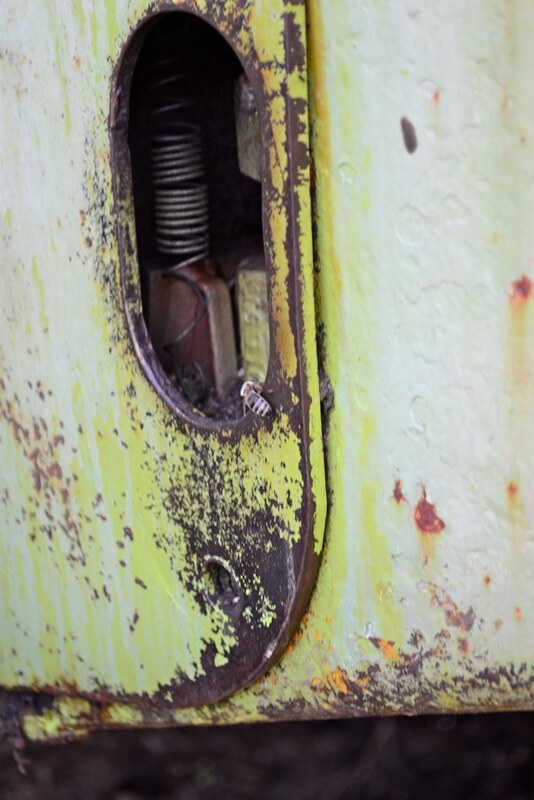 After further inspection, it turned out that the bees were significantly deeper into the inner workings of the winch housing. There wasn’t going to be any easy way to just sweep out the whole colony with the queen undamaged. There was another much smaller plate that could be removed, and sure enough, opening that plate provided a direct path into the main part of the hive. The opening, however, was barely larger than fist size, and the honeycomb was built perpendicular to the entry point. Henry did pull out a few chunks of comb and bees, but it became apparent that the queen wasn’t going to make it out intact with that method, and without a healthy queen, the colony couldn’t survive on its own. The plates were bolted back in, and we left for the night. A new plan was improvised. The next day, Henry brought out one of his weaker hives. 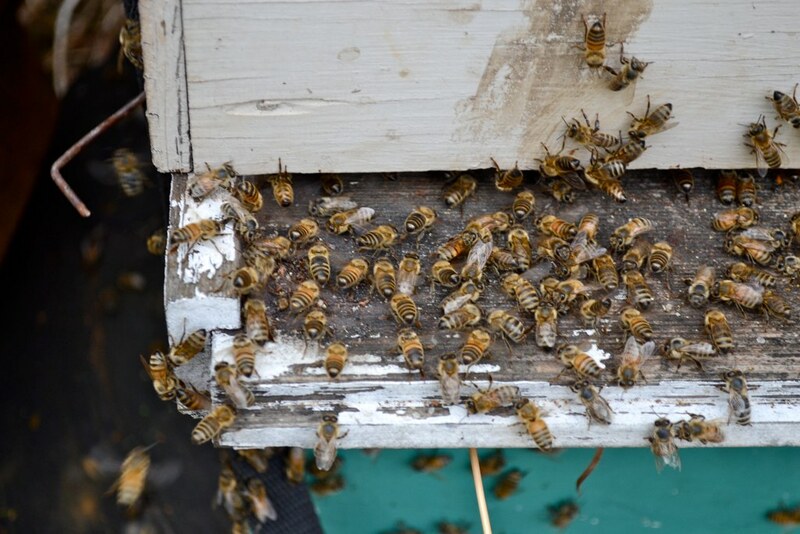 This colony needed a larger population to build up food reserves and heat the bee box over the winter. 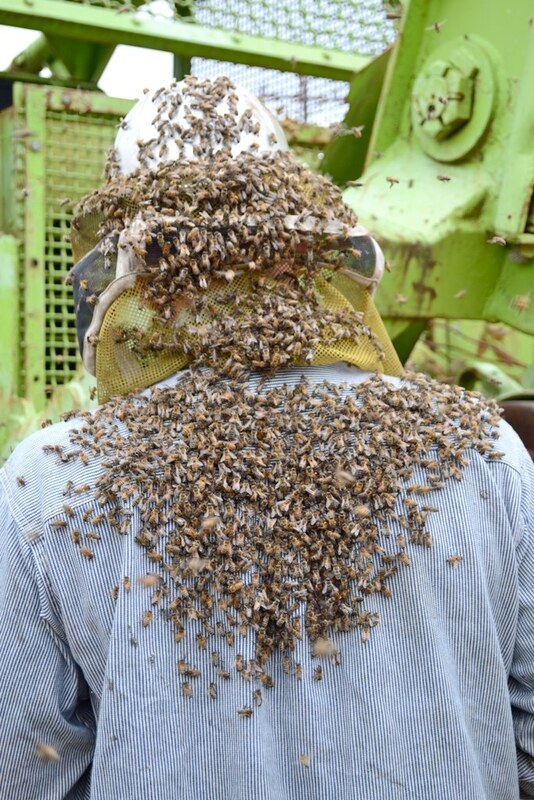 He was hoping to graft as many worker bees as possible from the dozer hive onto the weak one. 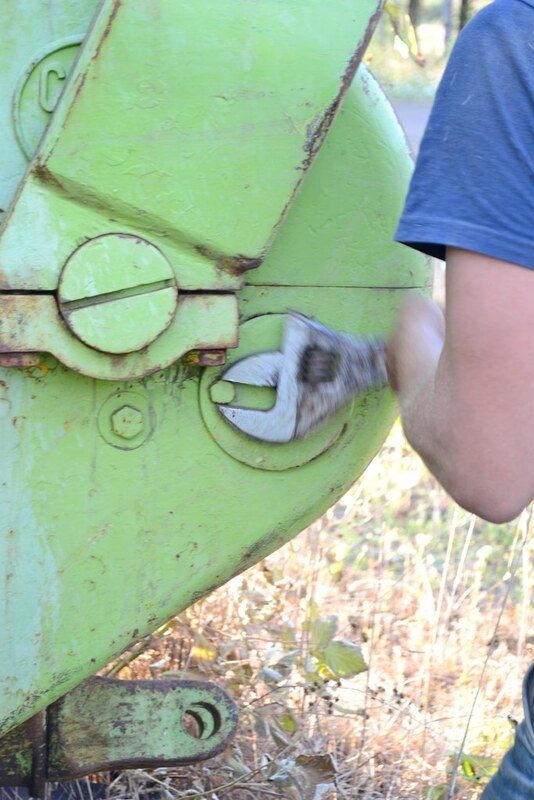 Henry unbolted both plates again and positioned the boxed colony as close as possible to the openings in the dozer. Then he started smoking them heavily. 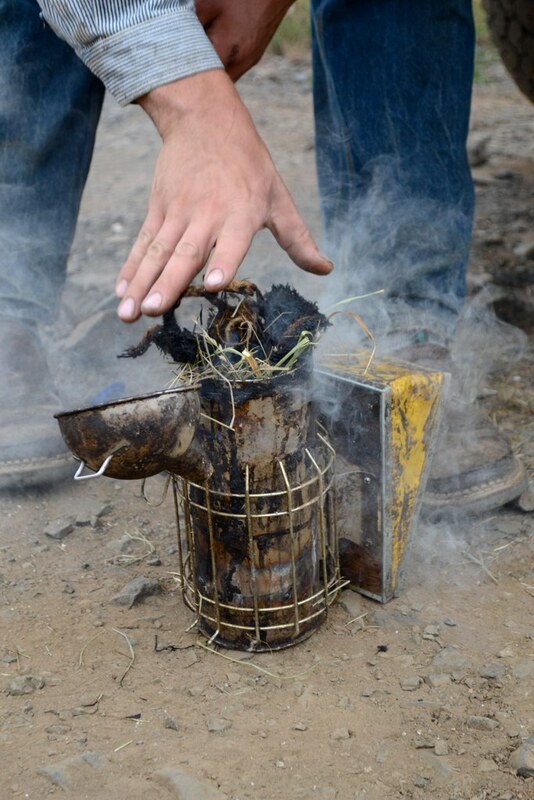 Bees boiled out of the holes and into the air. A cloud buzzed around the dozer and around us. When he suspected that most of the bees were out of the machine, he continued to smoke them as he reinstalled the plates and shut the flying bees out of their home. Miraculously, Henry wasn’t stung once. 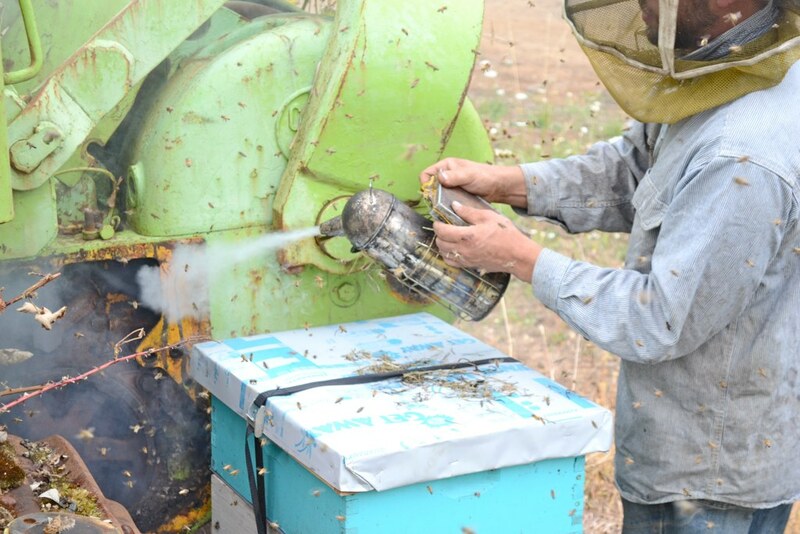 With more smoke and physical encouragement, a large portion of the bees that were in the air ended up in the new hive box. You can see in the above photo that the bees from the dozer are showing their new affiliation with this colony by sitting on the landing board and fanning. In the end, it wasn’t a totally successful ordeal. 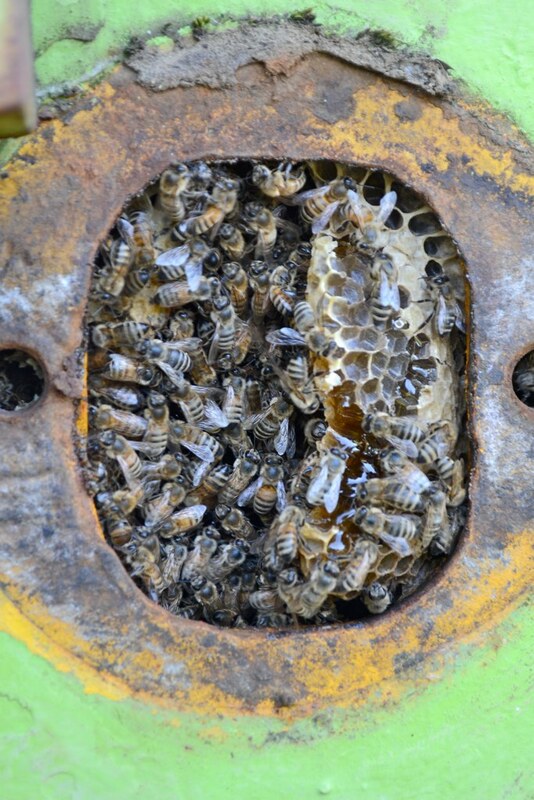 The queen from the dozer hive was likely trapped inside would die without enough attendants. A lot of unhatched brood was also lost because it couldn’t be retrieved from inside the dozer and transplanted into a new hive. 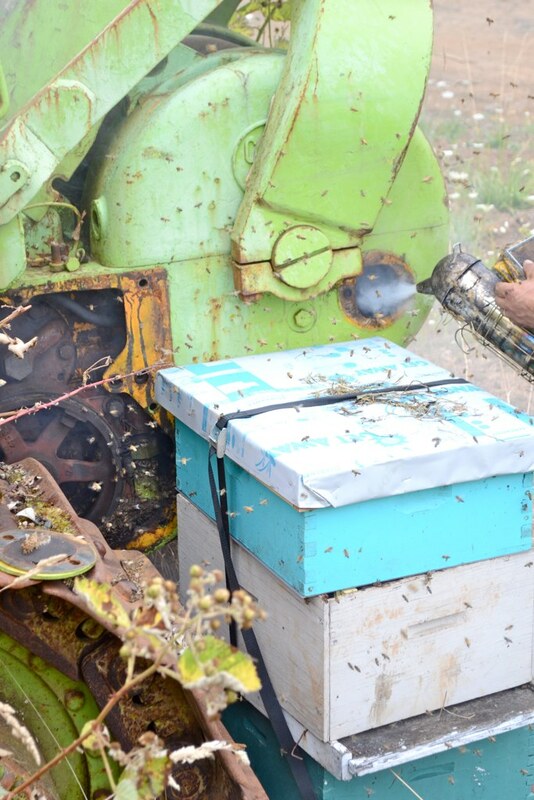 Some bees were spared, however, and the weak colony got a boost of new energy and bee power from the extra workers. Cool! My Dad had a couple bee hives when I was a kid. Chewing the honey comb was always a treat. Wish I would have known Henry was looking for bees earlier. I’ve had a colony I’ve been trying to remove for 3 years and they keep coming back. I also had a friend with a colony just down the road from where the pictures are taken that had a colony trying to start in his house. I hate to kill them but everyone I contacted wanted to charge $$$ for removal. Kent, Henry says he’ll do it for you for free because you’re “a cool guy.” The reality is that getting bees out of houses can be a huge pain that requires multiple sessions. 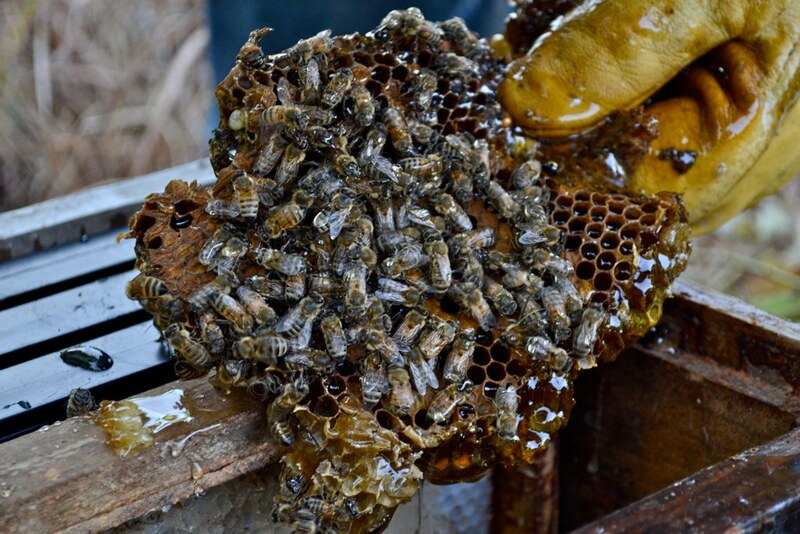 In many cases the colonies that are retrieved are weakened because they’ve lost a fair bit of brood and/or honey. 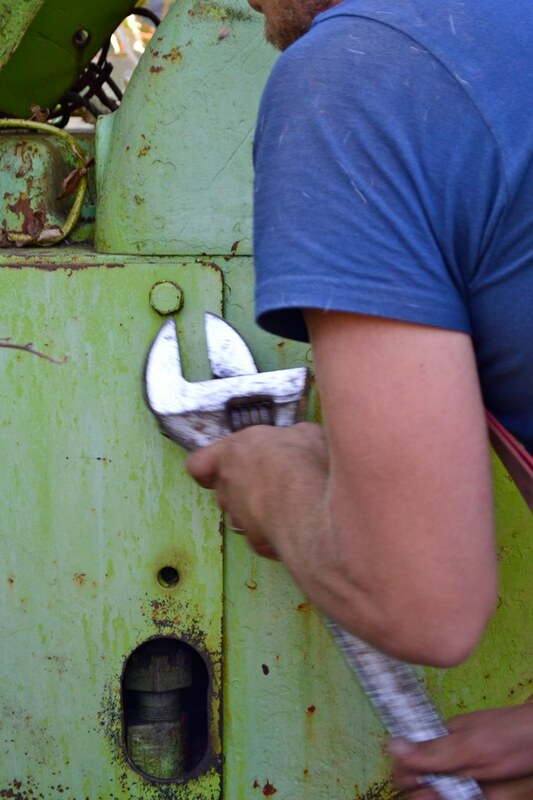 The going rate for extractions is something like $150, and in most cases it’s pretty fair for the amount of work involved although it can be a disincentive for homeowners to call their local bee guy or lady to get them out. My friend Cal coined the term. Cal, if you are reading this, I think you’re pretty brilliant. Maybe you could get one of those product-naming jobs. Wow, these wild bees are so fascinating. I love how Henry has just taken on this job like it’s no big deal. It looks terrifying to me!! Quite an undertaking- very cool! Now I know where to go if I decide to raise bees. Next year I hope! They are fascinating!